Building a car from the ground up is an incredible challenge, which is why many budding designers have to settle for re-bodying an already built car. Whether deciding the quickest way to live their dream of owning an exotic car is stretching those lines over a not-so-exotic frame — like a Ferrari out of a Fiero or a Porsche out of a Volkswagen Beetle — or just for the challenge, the results are usually outrageously memorable. True, they're mostly memorable for being disgusting, but that isn't stopping these designers you've helped identify from trying. While we've got our ten after the jump — tell us via the poll and comments below what car body kit you find the most outrageous. Without further ado, here's our ten most outrageous full-car body kits. 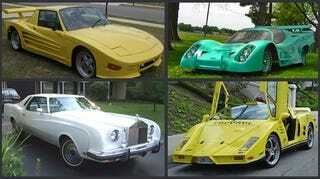 What&apos;s The Worst Full Body Car Kit? Click through the pictures to see each car revealed in all its glory.